Put the Mom’s brand to work to help you sell. 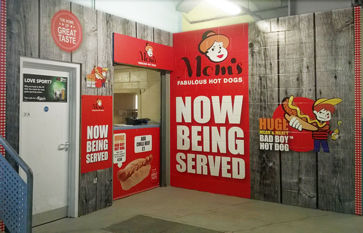 Our designers can put together a complete package, from a single kiosk to multiple sales outlets at major sports and entertainment venues. 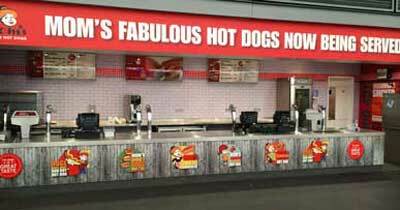 You can find Mom’s Fabulous Hot Dogs at the O2 arena, the SSE Hydro, at theme parks and rugby and football venues UK wide. We can give you the full works, from initial design through to print and installation. 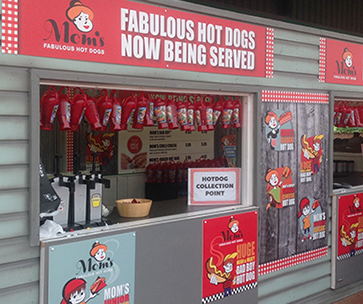 Brighten up your venue with a Mom’s Fabulous Hot Dogs kiosk and your sales figures will look a lot brighter, too.